Last morning of fishing. Not very optimistic after the previous day. Didn't get out very early. We went back to Snake Hole on the bottom of the island. Pretty nice water. Lots of casts. No sign of fish. This was one of those trips where it felt like the season was long over and we were the only ones who didn't get the memo. Paul on a rock, working a plug, at Snake Hole. There were pretty good conditions and we fished pretty hard hoping to catch a couple fish. We started on the long jetty at Old Harbor at sunset. Made a lot of casts on both side of the jetty and neither of us got even a hit. When the sun was down, we drove north to fish my spot north of Grove Pt. I had a good feeling as the conditions were almost perfect for this spot. We fished needles in the dark for a couple hours. Not even a bump. 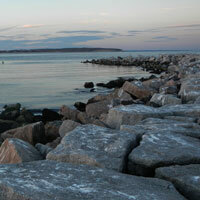 Sunset at the breakwater at Old Harbor. 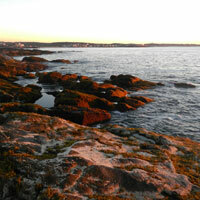 On a cold Tuesday morning, we tried SW Point and then Grace's Cove. I'm not sure if I've ever caught a fish at SW Point in the late fall. It's funny because it was maybe the best late fall spot on the whole striper coast in the 1980's. It was dead this morning and so was Grace's. 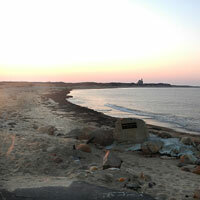 The beach between Cooneymus Road and Southwest Point at sunrise. 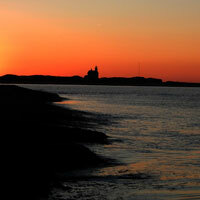 On the first of two nights on BI, Paul and I decided to fish sunset at Snake Hole to get the NE wind at our backs. We made a lot of casts until it was baically dark, but never had any action. We took a ride to Ballard's and fished in the darkness off the breakwater in Old Harbor. Nothing there either. Called it a night. 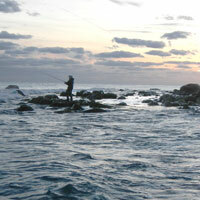 Paul fishing off a rock at Snake Hole, on the southern coast of the island. Well, I fished the Canal, behind the ice rink, for the 3rd morning in a row - pretty rare for me these days. Maybe three or four guys fishing. I had a good feeling about this morning, but nothing much materialized. At one point, I could see some fish splashing a few hundred meters to my right, so I packed up and hurried down there. I was just in time to catch one small bass before a big boat came through and ended the feed. That was it for the morning. I'm probably done at the Canal - time to try south county, RI. Another late October morning on the Canal. There were half a dozen fisherman behind the ice rink this morning - four more than yesterday. The water was really still and the fish never really showed up. I may have seen a couple break water. The fisherman on my left, who was also there yesterday, had a nice fish on for a while but dropped it. I ended up catching two stripers - 27" and 24". I stayed for a half hour after others had left because I had a good feeling, but nothing doing. A late October morning on the Canal. There was only one other fisherman behind the Gallo ice rink on the Canal this beautiful, crisp fall morning. That, plus my cold hands, told me that the season was winding down. A little after 7:00, just a few fish came through, but they were decent size. I missed one that grabbed my plug. Then I saw the dorsal of a big Striper going in a straight line with the current east on the Canal. My mackerel pencil popper was a good 20 yards behind, but I had two misses and then hooked up with a very fat 38" bass that I landed. I had another follow after that, but that's all. I was lucky as it only lasted ten minutes. 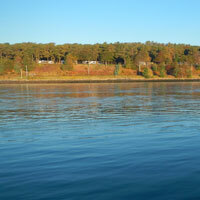 A nice late fall Striper on the Cape Cod Canal. 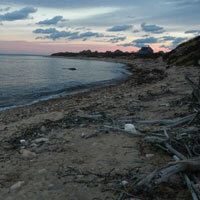 Columbus Day weekend is a family trip to our cottage on Block Island every year. I snuck out on Sunday to fish sunset at Dories Cove. I chose the west side because there was a nasty wind out of the east. I tried everything that I had in my bag, and I fished well into the darkness, but I never got a a hit or a splash. Looking north from Dories Cove. There was a northerly wind, so I went to a spot on the north side of the Canal, near the east end, where the wind would be at my back. Didn't help much. There wasn't any action until almost 8:00, when most of the fisherman had given up. I caught two 25" stripers and I missed 2-3 more, all in about 15 minutes. Then I went to breakfast. Looking east - near the east end of the Canal. Amazing - it's October 6th - and I caught my first Canal striper this year. Also, I caught my first Bluefish of the season - period. On the same morning. On my 4th or 5th cast, I saw a swirl about 10 feet from my white pencil popper, so I slowed it down, make some commotion, and wham. I was surprised to land a decent size Bluefish. I think that's just the 3rd blue I've ever caught at the Canal. About 20 minutes later, with an olive Guppy pencil, I hooked up again and it was a pretty good fish. I landed a fat 38" bass. And that was it for the morning. My first Canal striper of the season - on October 6th! I went to a good low tide spot on the back shore. Great water. Not a splash or even a swirl. 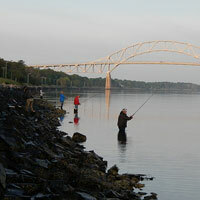 Where are those fall stripers? Skunked again. Look at that great water. 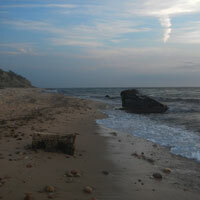 Last year, on Sept. 26th, I had my best fishing day of the season and I was on the back shore in Gloucester. So, despite the fact that it has been worse than slow, I headed there Thursday morning. The conditions were great, but there was no sign of fish. I tried everything in my bag, but never got a splash. 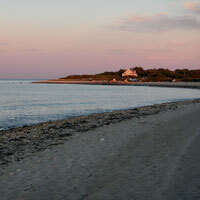 The back shore at sunrise. Grigoriy reminded me that there were ideal tidal conditions at the Canal this weekend. On Saturday, he went down there and got a 40" bass. So, I headed down behind the ice rink on Sunday. Grigoriy was there again. We fished from first light until an hour after the current turned. Unfortunately, it was dead on this morning. We drove over to Scusset, but you could tell from the number of fisherman heading to their cars, that nothing was doing there either. We casted for another half hour, with no action and headed to breakfast. Skunked at the Canal. The last fisherman, with the orange shirt, is Grigoriy. 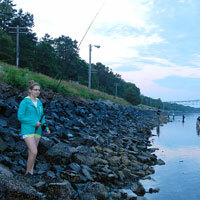 With a 5:30 am low tide, I chose a spot on the back shore that's easy to fish at low tide. The water was great but my expectations were low. After I was there for about 15 minutes, Paul Spinola and a friend showed up. They confirmed that the fishing had been very slow. After there was some light, I switched from a white to a mackerel pattern popper. I caught a small keeper and then another about 20 minutes later. At about 7:00, I hooked a bigger bass, but it got off and that was it for the morning. Paul and his friend didn't have any luck. I went and had coffee with Robbie who had caught a nice fish at another spot. 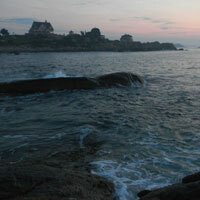 The rocky back shore at sunrise. I finally made it to the north shore. Unfortunately, I didn't get the memo that the fishing was nonexistent. It was spooky. It was September 12th, a good morning tide, a nice chop on the water and some wind at my back. I went to a familiar spot on the back shore and i was the only one there. I could see two or three other spots where there are always guys fishing this time of year and there was no one. Sure enough, I never saw any sign of fish. I fished in the dark with needles for about a half hour - nothing. After first light, I fished several different poppers for over an hour - nothing. And no other fisherman. I went to the coffee shop and no fisherman there either. Yikes. Must have been dead for a while. Sunrise on the back shore. This was the night of the new moon. 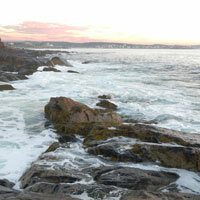 Plus, there was a pretty favorable incoming tide at sunset. I went down to Black Rock, because that put the brisk northerly wind at my back. I planned to fish sunset into the darkness. It was my last night on the island and I wanted to bring fresh fish back to Lexington. Unfortunately, the water was full of only 24-25" bass. I caught one on my first sunset cast from a favorite rock. Then another. Then another. I caught half a dozen on top while the sun set. It got very dark and it was very clear. The milky way was thick and opaque. The stars popped out of the sky. I put on a black Superstrike needle. Another 25" bass. A half dozen more. I finally gave up and quit. I thought about another spot, but chose dinner and US Open tennis on TV. 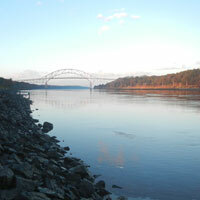 Looking west from Black Rock Point. It's the night before a new moon, so I picked up some eels. 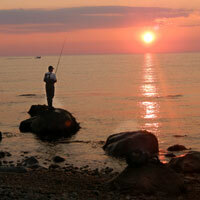 I fished sunset at Grove Point and it was totally dead. When the sun was gone, I moved north to my spot and started with needle fish. I got a 25" and 33" on the needle and missed a couple others. When it was completely dark, I switched to the eels, hoping to get a couple big fish. All I got in almost two hours was a couple more 24" bass. Disappointment. Was travelling for most of August, so this was my first time out in 5-6 weeks. Arrived on BI this afternoon with family for Labor Day weekend. Did a little sunset fishing at Dories Cove. Got a couple 24" bass on an olive colored popper. New moon this week and I will have a couple days to myself later in the week when I can fish pretty hard. Took some eels to my favorite night spot on the last morning of our two week trip. Only got one take and hooked up and landed a fat 37" bass. Good fight - thought it was bigger than that. Surprised there wasn't more action, but happy to get one decent fish, especially with the bright moon that night. Simona and I again went to Dories after dinner and I made some casts while she watched the sun set. There was a very strong left to right wind and the water was a little weedy, so was difficult to get one good cast and retrieve. On one of my better casts, I had a nice bass come all the way out of the water and miss my plug. That was it for the night. 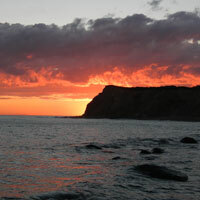 Sunset looking west from Dories Cove. After dinner, Simona and I watched the sunset at Dories. I plugged for about half an hour and didn't get a splash. 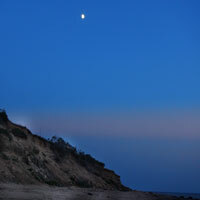 Pretty night moon over Dories Cove. We did a sunset picnic dinner at Dories Cove. After dinner, I plugged for about half an hour. I caught a small keeper on my first cast with a lot of people watching me. Absolutely nothing after that. Me - plugging from a rock at sunset at Dories Cove. Fished my favorite night spot north of Grove Point with needlefish. There was steady but slow action most of time I was there. The water was flat with almost no wind. I caught 5-6 stripers between 26 and 33". I missed about the same number and dropped a couple more. This nice bass took the dropper teaser. We all went down to Dorie's after dinner for sunset fishing. 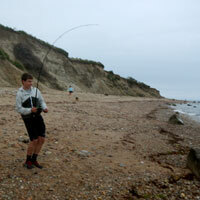 Great conditions - nice NE wind at our backs and a good chop on the water - and it was heavily overcast. 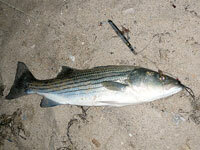 There are so many 20 lb class stripers around the island. It's great. 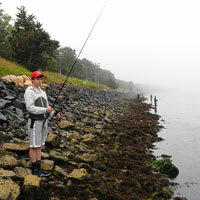 About 15 minutes after I landed a nice, fat 36" striper, Nico was into a real good fish which he fought for a long time. Turned out to be a 14 lb Bluefish. We got one more blue and one more striper and then it died. 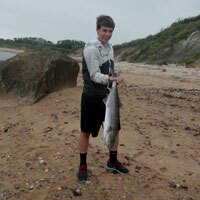 Nico fights and then poses with a big Bluefish he caught at Dorie's Cove on a 2 oz, white Gibbs. Went back to Dorie's on a very overcast morning at about 5:30. There was a slow take with the same nice bass on top. I just couldn't land one. I had two on and had 5-6 more good hits or splashes. Never got one on the beach. Still good top-water fishing. 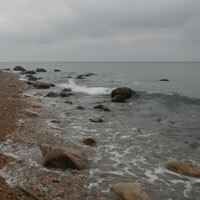 Dorie's Cove on a cloudy morning in July. 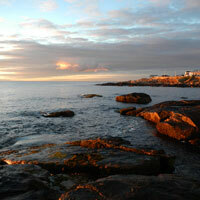 Dories Cove is walking distance from our cottage. I don't fish there much, but I had heard that the fishing was great last week on the west side. 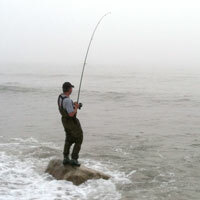 As I walked onto the beach, a guy from Georgia, walking to his car, told me he had been fishing all day with no sign of fish. He was wearing shorts and sandals and leaving at sunset. I put on an olive pattern Guppy pencil popper. Big splash on my 4th cast and I landed a fat 20 lb striper. I missed a few more big fish and then my wife and daughter showed up walking our Welshie. I asked them to hang out for 15 minutes because i was sure I'd get another nice fish. A few casts later, and I hooked big bass. Long fight, and nice pictures from Simona, and I landed a fat 38" fish. I missed a few more and caught another before it was dark. Great top-water action with big fish. Fighting a 20+ lb bass on a rock at Dorie's. Went back to Grove Pt. at sunset and an hour of casting produced nothing. A guy coming in from fishing on a kayak told me he'd caught a couple nice bass and seen lots more. I moved to my spot north of Grove Pt. to fish needles in the darkness. There was some action just as it got dark and then a long stretch with nothing. At about 10:00 it turned on again and there was pretty consistent action. I ended up with 5-6 stripers between 26 and 34". I kept one for fish tacos the following night. 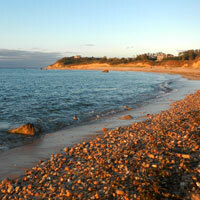 I'm with my family for two weeks of enjoying the sun on Block Island. On the 2nd night, I went out to fish sunset at Grove Point. There was a nice SW wind and the last couple hours of the flood tide. It was also a new moon and I really should have done some more serious fishing. More than an hour of throwing a pencil popper produced not even a splash. 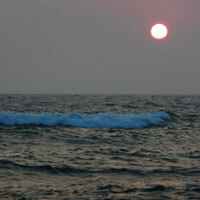 Then, about 30 minutes before dark, a big eruption and I was surprised by a very big fish. I was using light tackle and, after several runs, i never turned her around and i dropped it. Shoot. First fish of the season for me would have been a great one. One more good splash a few casts later and that was it for the night. Despite the lousy fishing the day before with Nico, I dragged Giulia down to the Canal on Tuesday morning hoping the fish would show up. There were even fewer fisherman than the day before. 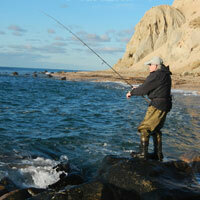 And for good reason - again there were no fish showing and we had no action at all. I did see a guy land a small keeper. We took a ride to Scusset, across from the power plant, and an old timer told me that this was the worst June at the Canal in a long, long time. Giulia and I went to Leo's for a nice breakfast. Giulia fishing behind the ice rink. On his first day of summer vacation, Nico got up at 3:00 and went with me to fish the Canal. We went behind the ice rink and there were fisherman there, but fewer that you would expect in June at sunrise with the current turning. It was foggy and and overcast. There was a "super moon" which caused an unusually low tide. I also found out from talking with a couple fisherman that the fishing at the canal has been really slow so far this season. All this explained why there weren't 1,000 guys down there. We saw one fish that a guy caught during the night, but we never had any action and didn't see anyone hook up. Most importantly, there weren't any fish breaking water and I didn't see any bait. Nothing like the past two seasons at the Canal. Nico plugging at the Canal on his first day of summer vacation. Finally got out for the first time this season. I went to the Canal and started behind the ice rink. Lots of guys fishing - I think they got some nice fish over the weekend. It's June 10th already, so I was expecting the big Stripers to pass through. I tied on my Mackerel pattern pencil with high anticipation. I never saw any fish show and I didn't see anyone hook-up. I had no action. When I left at about 6:00, I saw one guy on my left with a 34" striper. 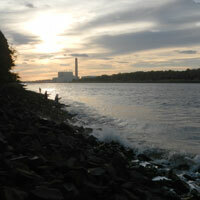 I headed over to Scusset, across from the power plant. I could see 4-5 nice fish that had been caught earlier. I fished another 45 minutes and had no luck at all. Disappointing. 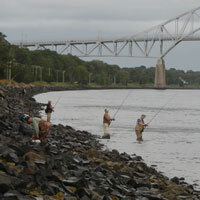 Plenty of fisherman at the Canal this June morning.